Please take a moment to read Part 1 of 3 of this tutorial if you haven’t already, as we covered several critical usability and behavioral targeting techniques that could make or break your SEO strategy. In this segment, we’ll cover simple ways to acquire top-performing search terms to target, along a few basic ways to use those search terms within that awesome content you drafted up in Part 1. As with any project, there are multiple ways to get to the same end result. The way I perform keyword research has evolved over the years and varies based on what my client is selling or trying to promote. For ecommerce, I may focus on category rather than product detail. For a website with a lead generation business model, I might focus on “selling terms” rather than broad “topic terms”. For affiliate marketing, I may require modifiers such as review, versus, compare, safe, coupon, etc. To keep things simple, today we’re going to perform keyword research for client that sells chopsticks you can personalize. You can guess all day long at which keywords will actually produce sales for you (or leads), or you can actually invest a small amount of cash in Google AdWords or Bing AdCenter (or both) to learn much faster. 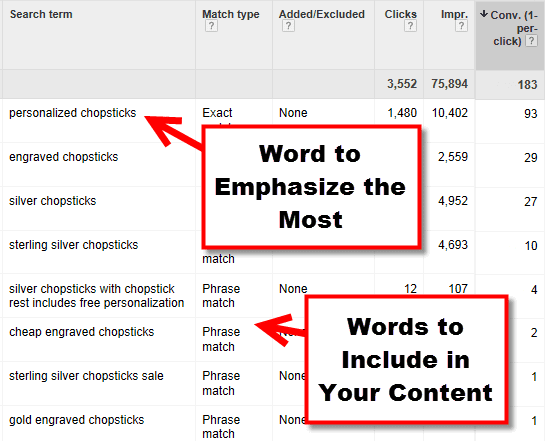 Avoid wasted pay-per-click dollars by sticking to phrases with the following match types: exact match, phrase match, and modified broad match. Run the ads pointing to your respective product page or landing page for several weeks (months if necessary), until you have a reasonable amount of data. 10,000 visits is reasonable data, 300 visits, not so much. 30 conversions is reasonable data, 3 conversions is not. You get the idea. Sorting your list by the top-performing keywords makes it simple to identify the phrases to give emphasis to in your web copy. Even better, your Quality Score may actually improve once the phrases are added to these pages, thereby reducing your pay-per-click costs. You can thank me later. The good folks at Google have been nice enough to provide several phrases that triggered your listing over the last 90 days. Simply login to your Google Search Console dashboard and navigate to Search Traffic > Search Queries. From this screen, select the “Top Pages” tab at the top and locate the product page or landing page you’re working on. If you’re at the starting line with your search engine optimization, having zero existing content and are in a hurry to get something online, option 2 & 3 might not be convenient for you. Thankfully, there are plenty of free techniques and paid tools out there to reverse-engineer competitor SEO strategies. Popular tools include SEMRush, SpyFu, and others. There are even off-page analysis tools you can use to identify words used in links pointing to a competitor’s landing page, such as AHREFS, OpenSiteExplorer and Majestic SEO. On the high-end side of keyword research, you’ll find tools such as WordTracker, Zenya, WordStream, and Market Samurai. These advanced tools often pull data from various sources including Google AdWords, which we’ll discuss in a moment. Expect to pay a monthly premium for most somewhere in the $50 – $200 range. The data can be worth the price if you’re committed to using the software. Regardless of which option (or all options) you chose, you’ll need to prioritize your list to maximize your conversion volume. Note that I did not say “to maximize your traffic”. Keywords that don’t convert to sales or leads can often result in high “return to search results” rates, which can be detrimental toward your SEO strategy over time. I like to use the Google Keyword Planner. We don’t trust it’s accuracy in terms of estimates in this post about the click-through rate of a 1st position listing, where offline we compared Webmaster Tools query data with AdWords predictions, so we’re going to ignore the numbers themselves, and instead focus on the popularity of keywords. Clean your list of keywords by hand in Microsoft Excel, sorting, filtering and using “Custom Formatting” to highlight, sort, and delete irrelevant themes. What you should have left is a list of 30-100 highly relevant keywords. Break these words into two categories: Selling and Topic. If the keyword is broad and not something a user would use when looking for a product or service, categorize it as Topic. Run your remaining Selling keywords through the Google AdWords Keyword Planner. If your industry has seasonality or is in a new marketplace such as new cellphone models, you’ll want to select the option to break the data down by month so you can view the most recent month’s search volume. Sort your keywords by search volume in Excel. Any keyword that produced more than one conversion should be on your required keywords list. Any keyword with one conversion should be considered for the top of your optional keywords list, just above the remaining Selling keywords from your research. Write your copy first, which you should have done in the 1st segment of this series, and then try to work your required keyword into the copy. When done, if there’s still enough room to work in the remaining keyword opportunities, go ahead and add in as many as you can without sounding repetitive or spammy. Give prominence to the most important keyword based on conversion data. Consider including the most important keyword to your page’s title tag, meta description and main heading. Your second and third most important keywords might make for great subheadings (H2 tags), but feel free to modify them with a supporting word before or after so it doesn’t appear odd to your readers. Googlebot loves links. Therefore, link to the page from other pages on your website, varying the link text with words in your required keywords list. Topic keywords make for great content marketing and link bait. They don’t typically result in immediate sales or leads, but over time could help build the authority of the website and pass some valuable internal PageRank to respective selling page(s).